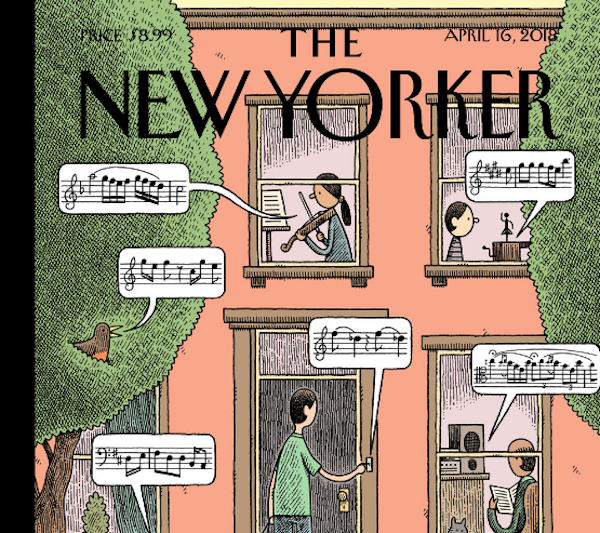 The New Yorker has unveiled its latest magazine cover by London-based illustrator Tom Gauld that will be music to your ears, literally. This ‘Soundtrack to Spring’ illustration plays music when visitors hover their mouse cursors over the respective speech bubbles. Tunes include bird vocals, notes from a door bell as well as an acoustic number. Gauld tells The New Yorker that he had found inspiration upon seeing his daughter play the violin. He also noticed the birds chirping in the trees and tried to emulate these pleasant moments through musical notes placed on the cover. Through the graphic, Gauld also aims to shift city dwellers’ negative attitudes towards their surroundings, and encourage them to channel more positive energy from within. Gauld explained that people usually complain about how noisy big cities are. This cover is meant to divert their attention to some of the more pleasant sounds enjoyed during springtime. The artist admits to facing difficulties with regards to thinking of what music to place on the cover. He wrote “placeholder nonsense” in the early stages of sketching in the speech bubbles, before coming up with the musical notes in the final version. Gauld reached out to veteran chorister Fergus McIntosh to help him on the musical repertoire that includes Vivaldi’s ‘Spring’, Beethoven’s ‘Spring Sonata’, Stravinsky’s ‘The Rite of Spring’, a folk song titled ‘One Morning in Spring’, and birdsong from the American robin. Listen to the notes and read the full interview here.